The cemetery has a unique blend of historical and modern sections. There are several individual family mausoleums found throughout the cemetery. 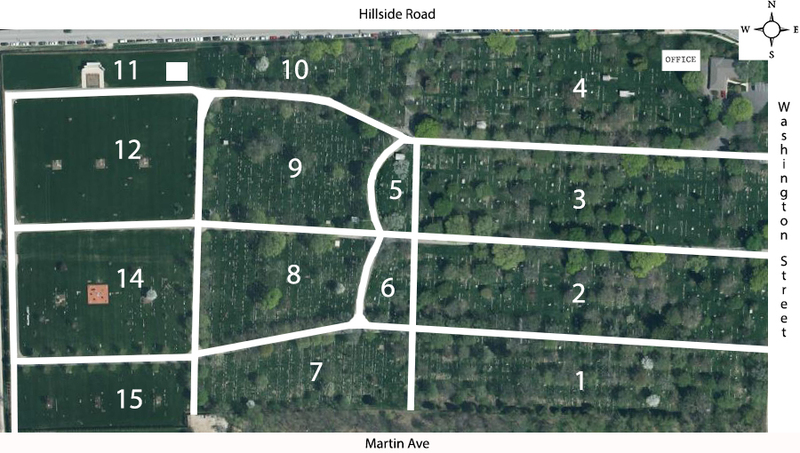 *White box indicates where the new columbarium is located. Sections 1 and 2 are the most historical sections with burials dating back to the mid 1800’s. Notable monuments in section 1 are the Civil War Grand Army of the Republic monument, Otto Kline’s monument, Naperville’s champion rodeo cowboy and star performer. Also nestled in among the more established trees in Section 1 are two columbariums with niches. Section 2 is where you will find the gravesite of Joe Naper, founder of Naperville, and his wife Almeda. Section 3 has large family lots of many notable Napervillians. Section 4 is where the current Babyland is located. Other Babylands are located in Sections 1, 2, 7 and 10. Sections 8, 9 and 10 starts the more modern looking monuments. A columbarium with niches is located in Section 9. Section 10 is home to the very unusual Springborn mausoleum and the Von Oven mausoleum can be found in Section 9. Sections 9 and 12 are where you will find the Congregation Beth Shalom Jewish Sections. Section 11 is where the newest columbariums are located. The mausoleum/columbarium was built in 2012 and contains 50 crypts in addition to niches. Our newest columbarium was built in the fall of 2017 and contains companion and single niches. Sections 12, 14 and 15 are where gravesites are available. Section 12 is the newest of the three sections having been developed in 2012. All three sections have garden areas in them where there is a bench for resting and reflection along with flowering pear trees and other plantings. Section 14 is where the Veterans Memorial was placed. Hillside Exit - In the summer of 2017 we closed the Hillside Road exit due to visibility and safety concerns. The road at the west tree line was extended out to Martin Avenue to provide an additional entrance and exit for our visitors and funeral processions.